Last week my seventeen year old came to me begging for me to make spaghetti, not because he wanted a big bowl of spaghetti, but because he was craving spaghetti pizza! It’s a staple in my house because we have always struggled with the famous “how much is too much pasta?” problem. Now, I just make a box or two and whatever doesn’t get eaten becomes something better. Something my kids ask for! Spaghetti pizza is pizza made from leftover spaghetti. The spaghetti isn’t a topping. It isn’t stuffed inside of a bread dough. The crust itself IS spaghetti! AND it’s really, really good! After a while, that second box of spaghetti that was accidentally prepared the night before, will be completely on purpose! You will make batches upon batches of spaghetti, to purposely have leftovers! You may even have family members going easy on your famous spaghetti, just because they want your spaghetti pizza the next day! The next time you have leftover spaghetti, of any amount, save it! Put it AND the sauce together in a bowl, and save it for the next day. You can even do this with spaghetti and meat sauce! When you’re ready, transfer it to a large mixing bowl and doctor it up a little! I like to add a little more Italian seasoning, fresh ground black pepper, garlic powder, and grated cheese. After you have doctored your spaghetti leftovers with MORE seasoning, beat your eggs. I use one egg for every two cups of spaghetti. If you have a small amount of leftovers, use one egg. If you have a bowl FULL of leftover spaghetti (because your teenagers tricked you), you may need to use up to four eggs! Pour in your beaten eggs, add flour and mix! Set your bowl of goodness aside and find your pan! You need a really good nonstick pan. Size doesn’t matter nearly as much as being completely nonstick does. If your pan is small, no worries, just make several personal pan pizzas! Your family may actually prefer the personal pan pizzas anyway — my little ones prefer them! Heat your pan with a liberal amount of oil. Vegetable or olive oil is fine, just don’t be shy. Spoon in your spaghetti and press into your pan until you don’t see the bottom. Leave a centimeter or so around the edges so the entire spaghetti pizza crust is cooked through. If you don’t have enough to completely cover the bottom of your pan, that’s okay, just round out the edges and keep your pizza in the center of your pan. Tip: You just want enough spaghetti to cover the bottom of your pan in a thin layer. If your layers are too thick, your pizza may not be handheld. My little ones won’t eat spaghetti pizza if it isn’t handheld. Cook on medium high for seven-ten minutes. The edges should start to look a little/lot cooked. You’re going to pan fry the pizza more on this first side than on the second. Don’t panic. This is the “hard” part (not really). Run a thin, flexible, smooth, spatula, under the edges of your pizza to be sure it isn’t sticking. Put on your favorite silicone oven mit, and grab a heat-safe plate. Invert the plate directly onto the spaghetti, right on the pan. Place your protected hand onto the bottom of the plate, lift the pan with your other hand and FLIP it over! Your pizza should now be cooked side up on your plate. Return your pan to the heat, oil it a little, and slide your pizza (keep it cooked side up), back into the center of your pan. Cook for an additional five minutes. Flip pizza out of your pan just as you did before, transfer it to your platter, and immediately add your cheese! Your cheese should melt very quickly without needing to be heated. If, by chance, your kitchen is cooler than normal, set your heat-safe platter inside a warm oven while you cook your toppings! Using the same pan, saute your pepperoni/salami until they are cooked well. Decorate your pizza with the cooked pepperoni. Add additional seasoning to your liking (more Italian seasoning, crushed red pepper, grated parmesan cheese), slice, and serve! The result is a flavorful pizza everyone will enjoy AND maybe even start to crave! Skip delivery pizza, don’t wait for the yeast to rise, grab the leftover spaghetti from your fridge and in minutes you have another great family favorite! Buonissimo! Transfer leftover spaghetti to a large mixing bowl. Add Italian seasoning, beaten egg, and flour. Mix well. Heat your nonstick pan with a liberal amount of oil. Spoon in your spaghetti and press into your pan until you don’t see the bottom. Leave a centimeter or so around the edges so the entire spaghetti pizza crust is cooked through. Cook on medium high for 7-10 minutes. The edges should start to look a little/lot cooked before flipping. Run a thin, flexible, smooth, spatula, under the edges of your pizza to release any spaghetti from the pan. Put on your favorite silicone oven mit, and grab a heat-safe plate. Invert the plate directly onto the spaghetti, right on the pan. Place your protected hand onto the bottom of the plate, lift the pan with your other hand and FLIP it over! Your pizza should now be cooked side up on your plate. Return your pan to the heat, oil it a little, and slide your pizza (keep it cooked side up), back into the center of your pan. Cook for an additional 5 minutes. Flip pizza out of your pan just as you did before, transfer it to your platter, and immediately add your cheese! Using the same pan, saute your pepperoni/salami until they are cooked well. Top pizza with the cooked pepperoni. This is a brilliant idea! I ALWAYS make too much spaghetti! What a clever way to use left over spaghetti. great way to deal with leftover spaghetti! Had to pin it so I can try it soon, thank you! This sounds yummy, we always end up having some leftover! This is a great way to use it up. My two favorite foods combined together! What a dish! I love ideas for repurposing leftovers! Thanks for sharing this one! Cool using spaghetti as the crust.. interesting.. I think it would make a filling meal. What a cool idea, I have definitely never thought about doing this before! I think my kids would love it too, thanks for sharing! I have got to try this! Pizza is my favorite so I am really looking forward to making this for my family. 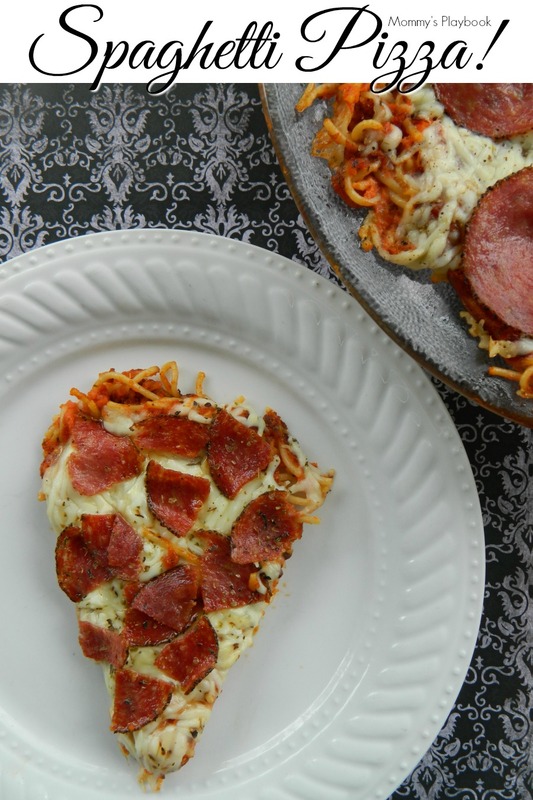 My mind is a bit boggled at the idea of spaghetti pizza–I’ll have to try that!